My buddy just blew up a 96 SS 6 speed. He made the decision to turn it into a 383 stroker. He will be using the 383 kit from summit with the forged rods but the hyper pistons. he is also using larger valve springs than stock for the lt1. Can anyone suggest anything? The cam he was using was the 306 cam from comp. close to 540 lift on the exhaust side i believe. he was thinking about using the same cam but also was thinking about going with more lift. I think the gears are 3.42's for now but he wants to go with 4.10's. To recommend a cam we would need to know his desired RPM range he wishes to make power (duration), whether he wants any power at all for driving on the street (LSA). Head flow characteristics (brand, port size and any port work), and spring pocket size (valve length is also important to specing springs) to determine amount of lift. Compression, exhaust capability, transmission stall if auto, and correct gearing all effect cam choice. Other wise it is just pick a 3/4 race cam, put on two glass packs, and call me in the morning. The desired RPM's would be from 1800-6000 somewhere in there. the compression would be around 10.5 to 1. it is a 6 speed. The heads are lt1 stock heads with larger vlave springs. the car will be driven on the street more often than the track. it is stock weight for a 96 SS. The gears are 3.42's for now but the guy wants 4.10's installed soon. I would try the 276HR-12 grind from Comp Cams (224°/230° duration @ 0.050" lift with 0.503"/0.510" lift on a 112° LSA) he is going to need a new chip good exhaust and a 2600-2800 converter with a decent intake (LT-4’ish) to make it work with a 383. Don’t forget the bigger motor will have more torque so his stall speed has to go up to match the increased torque. I don’t mind a rough idle and poor vacuum (a vacuum canister, or in a worse case, an electric vacuum pump off of a diesel pick-up truck can be used). If he wants a little less than that look at grind number 276HR-14 (220°/230° duration @ 0.050" lift with 0.510"/0.510" lift on a 114° LSA) I think he will need at least a 2,200 RPM converter and chip with headers and exhaust but won’t require as much on the induction side and should have more vacuum. Both cams should use a Comp Cams number 26918 beehive valve spring 1.55" OD with a 1.800" installed height, 130 pound seat and 287 open pressure with a 313 inch pound spring rate. Big Dave you are knowledgable but the fact you recommended an LT4 intake shows you are not experianced in THIS engine. The LT4 intake has the same ports and plenum as a 96 LT1 intake. http://i85.photobucket.com/albums/k54/gumplt1/DCP_1456.jpg as you can see in the pic it just has more material above the ports to seal to the taller ports in the LT4 heads, NOT RAISED as is often said, port floor is in the same spot they are just a 195cc port compared to a 170cc LT1 port, they get the bigger hole at least in part by making it taller. The myths about the LT4 intake being some improvement are VERY deeply rooted and frankly it is a minority who understand the differences. Because of that extra material it will not even bolt too LT1 heads as it will hit the valvecover rail. The 224/230 cam Dave recommended can be a good cam for a VERY mellow daily driver stroker LT1 absolutely zero vacuum concern. Actually a very popular cam for stock shortblock LT1s. The 306(230/244 .510.540 114) cam you guys were considering is OK in a stroker LT1 but there are a lot more options out there. Tell you what though there is a local f-body with a 306 in his 383 LT1, locally ported heads M6 car and while we have not linedup at the strip I have seen it run and my stock shortblock car with a bit less cam would leave him a ways behind. Heads are the key you said stock heads but sounds like he had the 306 cam in the 350ci motor? If so was he running stock aluminums or were the irons machined for screwin studs? Stock iron pressed studs with that cam would be more than a little risky. The LT1 castings can be good even on a stroker but they need porting and there are shops doing some amazing things with them these days. Please keep asking questions, car had to be a big disappointment with the 306 cam stock heads and 3.42s behind a T56 hopefully we can help him match components better this time. I would like to recommend something else on the rotating assembly too if he would be willing to listen. 10.5 compression might be OK on an iron head motor if he is running aluminums he needs to go a LOT higher like a full point. The car actually ran well. It had alot more power than a stock lt1 thats for sure. He has the stock aluminum heads. A motor shop guy told him he wouldn't port the heads so now he will have a motor with alot of potential that doesn't run as well as it should. he had 1.6 rollers on the heads also. The guy who had it before him had replaced to of the pushrods with 2 that were a little longer and those 2 pistons had marks on top from the valves. The guy must not have known what he was doing. If I was him I would have the intake ported and the heads ported to match. He will have a good motor and a stoke intake choking it. I am wondering why 2 push rods would make the valves hit the pistons? I am assuming they are adjustable? This is not a Gen 1 smallblock the intake is pretty good, the heads are a choke before the intake. 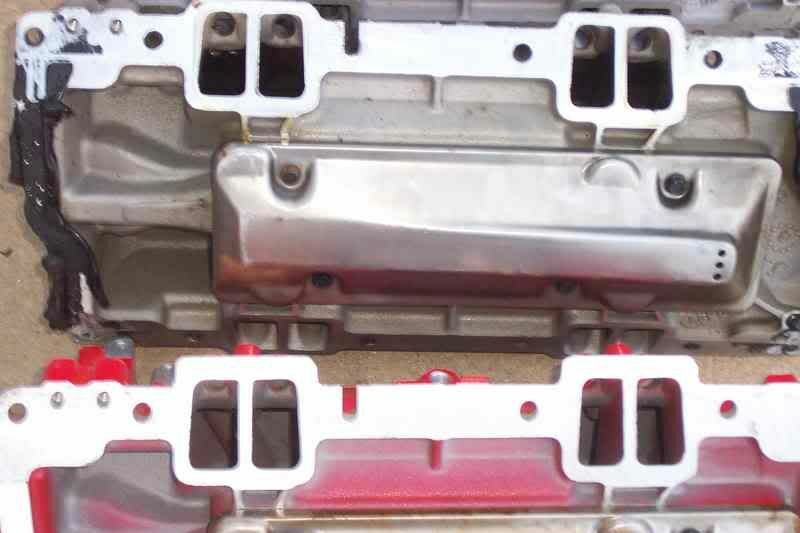 The aluminums at best equal the flow of the stock iron heads that were pulled off the car and more likely flow LESS. Worse news is that if he got the higher flow version that equals the iron heads flow then they are thin and not suitable for serious porting, the majority of the aluminums flowed less as cast than the irons but are most desirable for port work. Here is the company that did my heads and cam http://advancedinduction.com/AiHome.htm. Here is an ET and mods/conditions it took to get there list http://dan.esteban.com/impalass/ReturnTopET.asp?SelectedClass=4&Sort= the only car ahead of me(number 57) in my "class" is a gutted 3425lbs with driver race car. That site should be a valuable tool you can see what performance people have gotten and the recipe just be sure to look at weather and other details, if a cars ET looks really slow for the mods it is because some guys post times from 80degree+ humid summer weather which can easily make a car run half a second slower than good spring or fall conditions. I am still wondering why the valves hit the pistons? Longer push rods will never do that! So what is the actual problem? Yeah pushrods don't affect lift just geometry. http://www.grandsportregistry.com/lt1vslt4.htm is a site where you can view many of the differences between the two intakes in question. It also shows many of the other differences between the LT1 and LT4. Edelbrock just released two new intake manifolds for the LTx, one specifically for the LT1 and another for the LT4. The LT4 intake is more expensive. There are a few guys on the CorvetteForum thinking of moving up to the LT4 setup (including me on my 96 LT1 Vette). I've done a lot of research on this move and all I've read says the LT1 intake has to be welded and modified to mate with LT4 heads. The intake ports on the LT4 were raised .100 to straighten the airflow. That's one reason the LT4 heads outflow the LT1 heads by almost 30 cfm. The LT4 intake has no provision for EGR. GM determined it was unnecessary because of the LT4s increased camshaft overlap. All the cylinder head companies I referenced show two distinct casting, one LT1 and the other LT4. So this is much like a guy bolting on Vortec heads and elongating the intake manifold bolt holes. Yea, after that's done it'll bolt up but the ports don't properly align. One reason why Scoggins-Dickey, and perhaps others, came out with a specific intake for the Vortec heads. I don't like to fight and argue, I'm only relaying what my research has shown me. BTW, the 224/230 is an excellent cam; I'm running one very similar in my 415 CID L98 in my 86 Vette with MiniRam, etc. I had mine custom ground by CompCams using Xtreme lobes found near the back of their catalog - .603 lift with 1.6 ProMagnums. The cam you state is good with the 114 degree separation. GM made those separations to decrease the overlap. I never thought there was a problem with you're 1st post at all. It is a learning curve for all of us. The criticism is only constructional and will benefit every one here! Yes, I had mine ground on 114 LSA, too, for exactly that reason and to broaden the power range. I prefer low and broad as opposed to high and narrow. I only try to help and hope I haven't offended anyone - none was intended. 96caprice might sound to come off but he does that for a good reason! He has been there and has a car that pulls unGodly 60 foots! Definitely someone to talk to! As all Smokers we have 1 goal!!! FAST! !